As boaters, sailors, captains, and fishermen, they are the words that we all hope and pray that we never hear or to speak… ‘Abandon Ship!’ Being prepared is the one thing that could save your life if the inevitable should happen. Along with having all the required Coast Guard safety equipment aboard your vessel, having a ditch bag packed and ready to go with essential items can increase your chances of survival. 1~ The bag—Having all the essential safety equipment stowed in one single location is crucial when only seconds can separate you from going down with the ship and surviving. When searching for a bag, look for one that is water resistant. 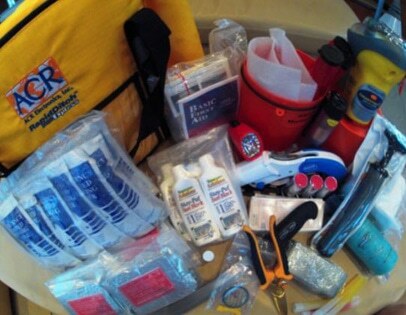 Many survival bags on the market are also manufactured from the same buoyant closed cell foam material as life jackets, allowing for flotation. Make sure the bag is large enough to carry the essentials, but not so large that it’s hard to handle. Remember, it may not be you carrying the bag. 2~ First Aid Kit—There are First Aid Kits available at many retail outlets. Some are packaged specifically for boating. They will contain bandages, wound dressings, burn treatment items, CPR and shock treatment kits, eye wash, cold packs, aspirin, and usually tweezers and scissors. They will usually have a waterproof card with basic first aid techniques. Many of the contents are in paper or cardboard boxes. Places them in zip-locks will help keep them dry. Also if you are on a long journey, an ocean crossing or delivery for example, it’s a good idea to put some of your important personal medications in the kit as well. 3~ Motion Sickness Tablets—These will also be in most First Aid Kits, but it wouldn’t hurt to stow a few extras in the ditch bag. Most have been lucky enough not to feel the pains of being sea sick, but the first thing that should be done when you enter the water in an abandon ship scenario is take motion sickness pills. You will be feeling the ‘motion-of-the-ocean’ in a much different way when in a small raft or directly in the water. When sea sick, you become dehydrated. This only adds to the situation. So, take your pills! 4~ Flares and other Signaling Devices—Hand flares, flare gun with aerial flares, glow sticks, die markers, air horn, whistles, and signaling mirrors should all be considered when preparing your ditch bag. The Coast Guard requires ‘visual distress signals’ including flares. Flares do have an expiration date so make sure that yours are up to date. Saying this, however, doesn’t mean you should throw the expired flares out. Keep them. When it comes to surviving a ditching at sea, you want all the fireworks you can get, expired or not. 5~ EPIRBS or PLB(Personal Locator Beacon)—These are the most costly of items in the ditch bag, but when it comes to your life, they’re priceless. Once activated, these devices will send you location to a series of satellites in a worldwide network dedicated to search and rescue. Learn how to properly operate these devices and make sure batteries are checked on a regular basis. 6~ VHF Radio/SAT Phone—Communication to surrounding boats and the rescue authorities will help reduce your time in the water. There are waterproof models available on the market today. 7~ Compass—It is easy to get disoriented when drifting around the ocean. Having a compass will help convey to responders your drift from you last known position. 8~ Serrated Knife—Along with your scissors, have a good sharp serrated knife. A serrated knife will cut through the strongest of lines if you’re in the position to lash things together. 9~ Duct Tape—Use it for lashing to patches, or even bandages. 10~ Flashlight and Batteries—Flashlights can be used not only to see, but also for signaling. Check batteries on a regular basis. There are flashlights made today that require no batteries. Survivor flashlights, or forever shake lights, are perfect for a ditch bag and can be purchased for very little money. 11~ Water Packs and Dehydrated Food—These can be purchased from several companies online. Many life rafts have these already in their survival packs. When you have your life rafts serviced, it’s a good idea to ask them to return to you the contents of the raft’s survival kit. The water and food packs usually have longer expiration dates then the raft service schedule, so why not put them in the ditch bag. And those with military service know, C-rations and MRE’s last forever! a. Sunglasses and reading glasses—Spare glasses in a ditch bag are important as you may not have time to collect your own from a sinking vessel. b. Air Pump—This is especially important if you are getting into a raft. The last thing you want is to have to abandon your life raft too. c. Fish Hooks and Line—We don’t want to think it, but depending on your proximity to land and rescue responders, there is a chance you may be at sea for a prolonged period of time. Your raft will turn into a floating habitat for fish, so be prepared to catch some for food. d. Sunscreen and Lip Balm—The sun can be intense when totally exposed to the elements. Protecting your skin from the sun will also help prevent dehydration. Solar Blankets are also a good idea to have in the ditch bag to help stay out of the sun. These are some tips for filling your ditch bag. Add whatever other safety equipment necessary to put you at ease when at sea. None of us want to be in the water waiting for a rescue team to pick us up, but being prepared and knowing what to do is the key to survival. Be safe out on the water. Remember the best fishing trip is the one you come home from to tell about!